By Ernest W. Kornmehl, M.D., Robert K. Maloney, M.D., Jonathan M. Davidorf, M.D. Ernest W. Kornmehl, M.D., Robert K. Maloney, M.D., Jonathan M. Davidorf, M.D. If you would like to improve your vision and reduce or eliminate your need for glasses or contacts, perhaps you’re considering LASIK. This procedure has become one of the most popular vision correction surgeries in the nation. Nine million LASIK procedures have been performed since the procedure was approved by the FDA. How much vision improvement can you expect? How does the new wavefront technology improve LASIK? How do you choose a qualified physician? What follow-up care will you need after the surgery? What is a PRK procedure? “This excellent resource is recommended for consumer health collections.”—Library Journal, November 2006. 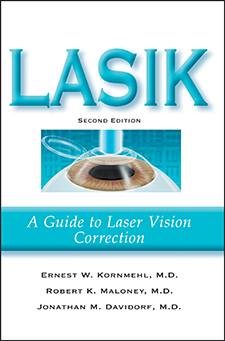 “A clear, concise overview of the laser vision correction known as LASIK.”—Consumer Health and Patient Information Section, Medical Library Association. Ernest W. Kornmehl, M.D., F.A.C.S. Jonathan M. Davidorf, M.D., F.A.C.S.